of course … it should really be spelled “judgement” right??? luckily, even though MS Spellchecker says i am wrong with my spelling, dictionary.com says i am right. This entry was posted in question on December 18, 2006 by auren. I thought I’d give myself more time to work in December (we’re releasing some big products) so I consciously cut out holiday parties during the week. This was especially important this year since the holiday season started early due to an early Thanksgiving. Now I love holiday parties … they’re a lot of fun. But sometimes one has to cut out some hard stuff to buy time. This entry was posted in Connector on December 15, 2006 by auren. this is a great book. after reading this you’ll realize why Lincoln was the right leader at the right time. i highly recommend this book … and it is available to listen on Audible. This entry was posted in Books/Movies/Shows on December 15, 2006 by auren. this is a great book. Godin is always interesting and thought-provoking. i often think he is one of the more under-estimated thinkers. and the book is available in Audible (and read by the author) … i highly recommend it. This entry was posted in Books/Movies/Shows on December 11, 2006 by auren. To me the purpose is the increase life, decrease pain, increase happiness, and help others. One easy way to increase your happiness is to decrease your pain points. Think of all the things you’ve been complaining about and see how to can eliminate them. Like if your friend is always late and it really annoys you, buy your friend a reminder service. I have a bunch of friends that have made some money that are always complaining about time. They feel they don’t have time to do this or that. They don’t have enough time to read (they say). They don’t have enough time to work on a cool project. They don’t have enough time to play with their kids. But you can buy time. Need an extra two hours a day? Buy it. Time isn’t cheap. But if you can afford it and it is your biggest pain point … then buy some time. Some people invest their excess cash in a really nice car or a really nice watch. Or they throw a huge birthday party for themselves. Now these are all fine things … but they don’t solve most people’s pain points. With my extra cash, I buy time. I drive a normal Toyota and have a $10 watch, but I have a personal assistant. For years (when I was at Stonebrick) she worked out of my home. Now that I’m at Rapleaf full-time, she helps out with things occasionally. And she is REALLY helpful. Yep. Paid for time. How much is time worth to you? If you say you’re worth $300/hr because that’s what you make in the office, then a free hour where you can do anything you want is worth more than $300. because you can do anything you want in that hour. Anything. So you should be willing to pay at least $300 for someone to do a chore you were going to do so it frees up your time so you can do something else. And if it costs less than $300, then you should assume that you got a steal. A real steal. Time is very valuable. But you can buy it. This entry was posted in Theories on December 7, 2006 by auren. First — never compromise. Never. Always go for the best talent. If you are worried or have a slight doubt, don’t hire them. Great people are everywhere. Of the five candidates we hired, two were friends, one we found from Doostang (but was a friend of a friend), one from CrunchBoard (the TechCrunch job board which costs $200 to post), and one from Craigslist. 4 of the five people were engineers and one (from Doostang) was marketing/BD. Overall, craigslist still was the best job board. We found we had to post multiple times (at $75 a pop) but found it most effective in getting us candidates. You also can get a lot of junk from craigslist. A lot. But it is worth it. CrunchBoard was great too. LinkedIn is a great tool — and while we did not post on LinkedIn, we did use the site to proactively recruit people. And while we did not hire anyone from LinkedIn, we did make one offer and also found many great candidates who were just not cultural fits. We found a few great candidates by sneaking into Linux World and posting up flyers in the bathrooms and above the urinal stalls. Vivek Sodera, Rapleaf’s enterprising marketing hire, pulled out all the stops to help us recruit engineers. Our biggest disappointments were the Ruby Jobs board and Om Media job site. Ruby Jobs got us a few unqualified resumes. The Om Media jobs site yielded a total of zero resumes (though we did get one call from a recruiter). I’ll probably try both of these boards again in the future … the Ruby one is very targeted but might be too national. We were one of the first companies to post of Om Media — so that channel’s failure might be a factor of it being too new. We hope for better results next time. We did not end up hiring from any recruiters. We found most of the recruiters we worked with did not provide great engineers and one of them had not even heard of Ruby. However, there were a few recruiters that were quite good. Dane Santos and Attilio Armeni were particularly good and we will definitely be using them again. Don’t be afraid to tell it like it is. One thing we did well is we had realistic job descriptions. 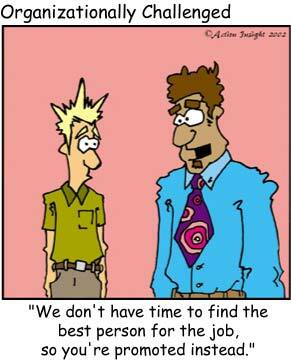 We stated clearly that we work insane hours right now and that we expect new hires to do the same. We never sugar coated what we do and we got people really excited about the role and the goal rather than the perks. We had a really tough interview process. For the non-engineer position we looked at over 660 resumes, did written interviews with over 100, did phone screens with over 60, and did in-person interviews with over 40. For engineers we had an even bigger pool. We had all candidates do a project where they could show us their creativity, dedication, and intelligence. (note: since I get a lot of emails from people about recruiting, I’ll try to post more about this in the future). This entry was posted in Web/Tech on December 3, 2006 by auren. Martin Rees is amazingly intelligent. 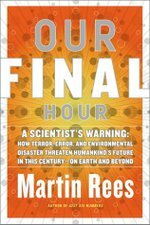 this book goes over dozens of hypotheses of how our worth could be devastated (from a bio-terror (or bio-error) event to the potential of an asteroid hitting the earth to an environmental catastrophe). First it explains the potential, then it goes into the likelihood, and then it talks about a potential solution. special thanks to Rob Reid who told me about this book two years ago and i apologize I am just getting to this now. This entry was posted in Books/Movies/Shows on December 3, 2006 by auren.